« Mipmaps messing around with costumes? Androu1 just figured it out. It was posted on August 31, 2008 at 12:00. There's 18 Comments and it's in Androu1. 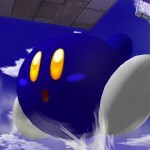 Ever wanted to see Meta-Knight unmasked in full Tri-Dee action?! Ever wanted him to show you his moves?! Well,your dreams can come true with this custom costume! Seriously,this was one of Androu1’s first costumes.He’s really happy with the few creative liberties he took on this one. Kenny wrote it. Don't look at me. Ha ha ha, kickass. Maskless Meta is nice. 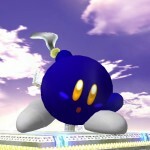 By any chance just out of curiousity, do you think you could pull this off on actual Meta Knight? Just wondering. This is really cool. Oh and er, why are his eyes yellow? MK IIRC has white eyes. Just asking. MK has yellow eyes.I just played Kirby Super Star and he has yellow eyes. Awesome hack, but a few things are wrong with it. First, Meta-Knights eyes are white. When he’s wearing his mask they’re yellow, but when he’s not they’re white. 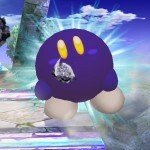 Second, the red circles on Kirby’s cheeks are also red on Meta-Knight. Third and last are his shoes. In the games they’re more of a pink color, but in Brawl they’re purple. You didn’t use either of these colors. 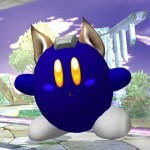 You can see Meta-Knight without his mask at the link below. If you fixed these this hack would be prefect. Hhm… his shoes are meant to be purple; plus, his shoes are purple. 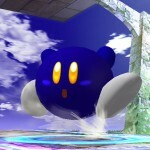 In the Kirby games, his feet are purple, because they are sprites, so it was pink. So it’s fine, the only thing is it’s his shoes, it’s suppose to be purple, and MK was wearing a purple armor for his shoes. 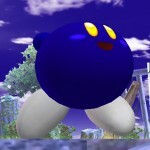 didnt he show his face in kirby squeak squad when he gets defeated by kirby? you know, if his shoes are purple, it means his shoes are purple. so, if his shoes are purple, by default, his shoes are purple. thus in conclusion, his shoes are indeed, blue. Soniku, we fixed that a long time ago. Actually when you deafeat meta knigh, his mask plits into two and you get a glimpse of him maskless and I know by defeating him 50,000 times, his eyes are white behind the mask. I prefer MK with yellow eyes. There’s a hack of the actual MK model with his mask off. I wish there was version where it had this cute little face on it.